The regular arm application is used when the closer is mounted to the pull side of the opening. 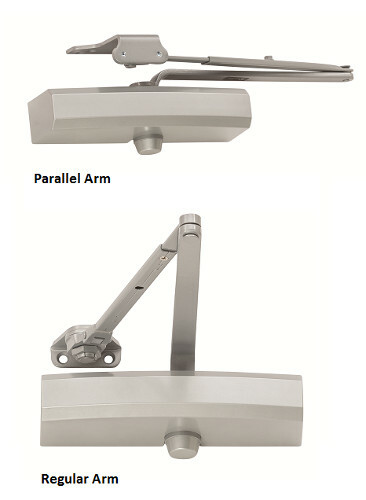 The parallel arm application is used when the closer is mounted to the push side of the opening. When installed correctly, both applications may permit the door to swing a full 180 degrees. A sized closer has a specific closing power for a certain door application. Many closers are adjustable in size, meaning the spring power can be changed to suit the needs of the opening. Closers can be concealed in the door, in the frame, or in the floor. Caution must be used when choosing a concealed closer in the door or frame because there must be enough space to allow the closer body to be installed. Automatic door operators will automatically open a door when actuated by an individual and will act as a closer to keep the opening under control. We have all the parts and pieces to provide a working system. 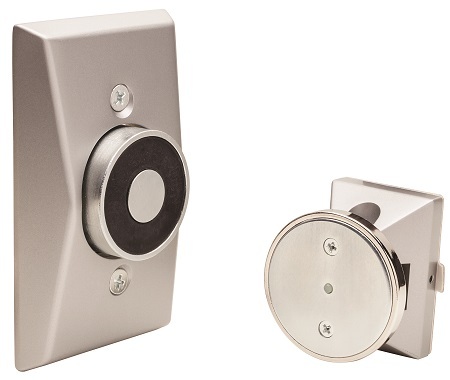 See electrical hardware and access control components to learn more. • Hold Open – Built into the arm of the closer and can hold the door open at 90 degrees or more. • Rigid Parallel Arm – Heavier duty arm for use at openings with high-frequency use. • Stop Arm – A stop is fastened or cast into the shoe of the arm assembly which stops the door from swinging past a certain point. 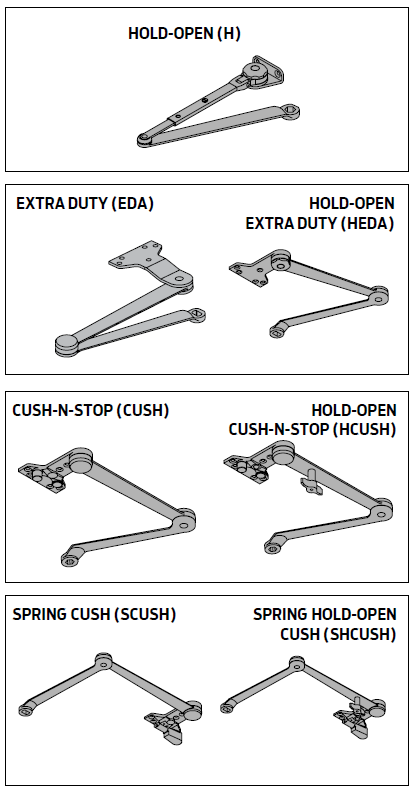 • Stop and Hold Open – Combines the hold open function and the stop arm. Double doors often need the added control of door coordinators. 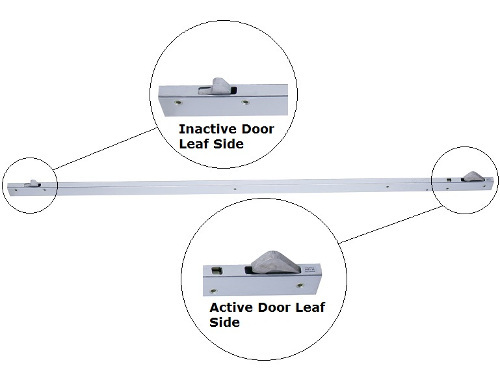 When the inactive leaf on a pair of doors needs to close before the active leaf, a coordinator will be required. There are a few different types of coordinators, but the most common is the soffit-mounted coordinator. Door coordinators allow proper closing and latching to prevent damage to the doors and ensure the security and function of the opening. Note: if closers with parallel arms will be used, you must install mounting brackets for the arms. Magnetic holders are often used on openings that are regularly kept open but need to be closed for security or to act as a fire barrier in the building. Magnetic door holders are usually tied into the fire alarm system. In the event of a fire, these magnetic holders will disengage and release the doors allowing them to close.